Photo taken after six days. For the record, I would have guessed 28 days, which looks now to be more of a wish than an estimate. As I tell my sons, an estimation is not a wish. If you consistently under or over estimate, you’re wishing. It’s good that I’m doing this. I really need to get a handle on use. 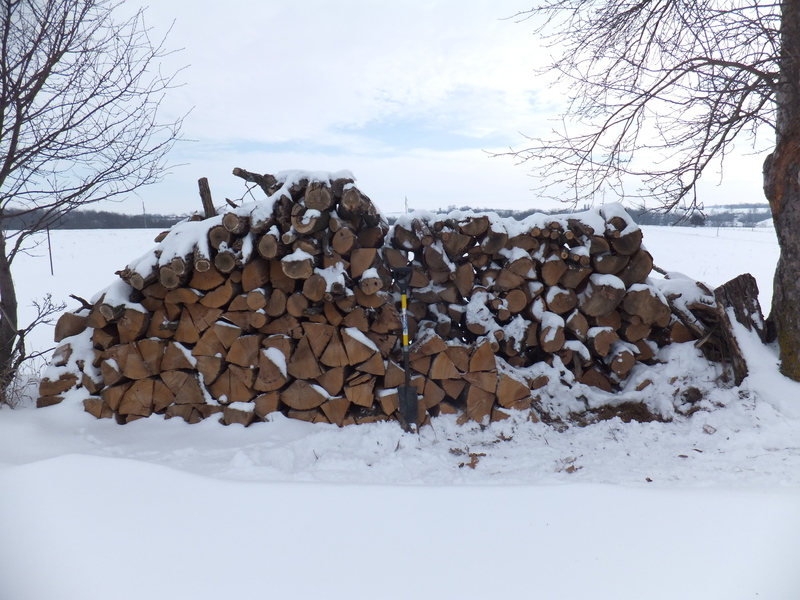 I estimated the large pile I built up over the summer would last 3 to 5 months. Not a very precise estimate. It looks like it’s going to last about three months as I didn’t start using it until the middle of December. Until then I was cutting weekly loads because I had time and the weather was nice. Thank you to our contestants. I’ll update again within a week. This entry was posted on Friday, February 8th, 2013 at 5:30 pm and is filed under Curious farmer, Curious living. You can follow any responses to this entry through the RSS 2.0 feed. You can leave a response, or trackback from your own site.